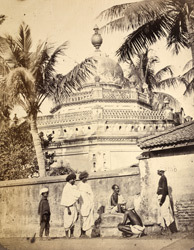 Photograph of an unidentified tomb at Vellore from the Archaeological Survey of India Collections: India Office Series (volume 21, 'a' numbers), possibly taken by Henry Dixon in the 1860s. Vellore is situated 129 km west from Madras. The town is famous for its sixteenth century old Vijayanagara fort and for the Jalakanteshvara temple. In 1780 an English garrison held out against Haidar Ali for over two years. After the fall of Seringapatam in 1799 Tipu's family were detained in the fort. About 1.2 km to the east of the fort there are the Tombs of Tipu Sultan's Family. Entering the walled enclosure on the right are the tomb of Padshah Begum, Tipu's wife, who died in 1834 and Aftab Khan's tomb. A large granite pavilion contains the tomb of Mirza Raza, who married one of Tipu's daughters and at the end there is a six metres mausoleum with a high dome to Bakshi Begum, widow of Haidar Ali, who died in 1806. The tomb in this view is not identified.